You are probably already nodding your head in agreement. I feel bad for many of the potential clients that approach me to come in for a talk. They call me with great excitement after having found me. We have a great discussion around the ways that I will kick their innovation efforts into high gear and accelerate their capabilities. We speak about the vast range of trends that I will cover for them in order to help their team comprehend how their industry, customers, market, and business model is being subjected to relentless change. Excited, they take it to their ‘team’ or their boss, and the answer comes back: “We don’t need to do it right now.” This happens far more often than you might believe. 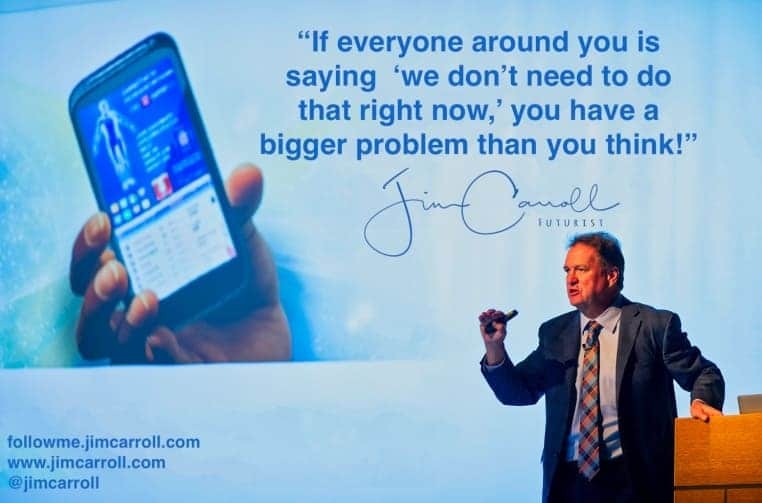 So much so, that I wrote a blog post around the trend: “What does it mean when your CEO says we don’t need to do that right now?” If you don’t prepare for the future now, when do you? After it happens? That doesn’t make a lot of sense. And yet, countless people and organizations do exactly that. Then, they sit back and complain with astonishment: “Whoah, I didn’t see that coming.” You should have, because the future is happening all around us, right now, at this very moment. How do you fix this? Read the blog post above for some great ideas!